Turquoise Place Resort beachfront condo for sale in Orange Beach Alabama, This 4,700+ Sq. Ft Turquoise Place Penthouse is reserved for the Discriminating Buyer desiring a residence unmatched by the ordinary condo. Quality and elegance blended with comfort make this the perfect destination vacation or corporate retreat. With 12' ceilings, the open living, dining, kitchen concept and 2 Master Bedrooms span the entire Gulf Side for the ultimate in Panoramic Coastal Scenery. Remote control drapes, surround sound, and wet bar with icemaker & wine cooler make entertaining or just relaxing a breeze! all 4 bedrooms are perfectly positioned for privacy, each with their own baths. 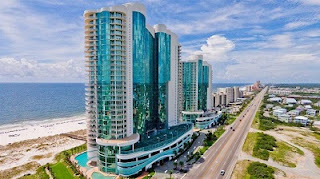 Both Master suites offer Gulf Front Views w balcony access and large Master Baths with His & Her vanities, oversized jetted tub, separate shower w 6 shower heads & walk-in closets. Media room w surround sound is the perfect place for family movie night or watching your favorite team. Other custom features include custom paint, custom bed linens, luxury pendant lights over breakkfast bar & wet bar and chandeliers in Foyer and Dining Room. The 920 SqFt balcony offers incredible long range views all the way to the Pass plus privacy while lounging, grilling or relaxing in your private Hot Tub.